What is a Publican and a Pharisee? A Pharisee was an externally decent and righteous man of religion. The Publican was a sinful tax-collector who was cheating the people. Though the Pharisee was genuinely righteous under the Law, he boasted before God and was condemned. The Publican, although he was truly sinful, begged for mercy, received it, and was justified by God. Read more on the Orthdoxwiki website. 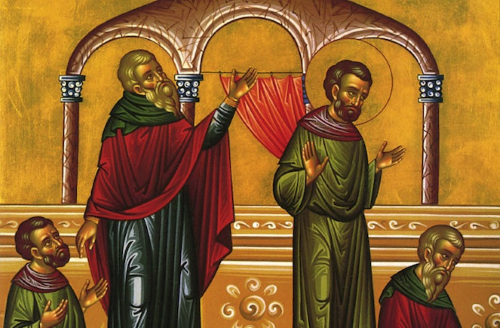 To learn more about the Parable of the Publican and the Pharisee, listen to Fr. Thomas Hopko’s podcast on the St. Peter website. Fr. Hans has started house and business blessings. Phone calls are fine too but only as a last resort please. Please a several available dates ready. The schedule fills up fast but Fr. Hans will make every possible accommodation to meet it. Cathechumen/New Member class on Mondays at 7:00pm. Catechumens are required to attend but anyone seeking a better understanding of the Orthodox faith is encouraged to attend as well. General and Mens Bible studies on alternating Wednesdays. See schedule below. 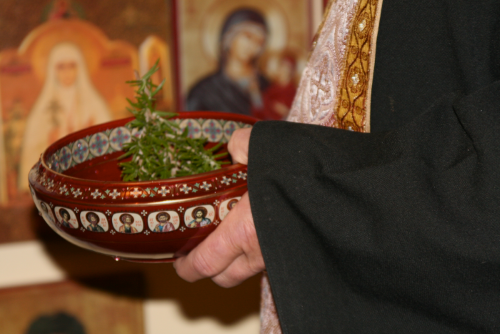 St. Demetrios Brotherhood meetings (for young men) moved to Thursdays at 7:00pm. If anyone would like to join Bill and Mary’s Copeland’s team please contact us in church or call 239-498-1331. 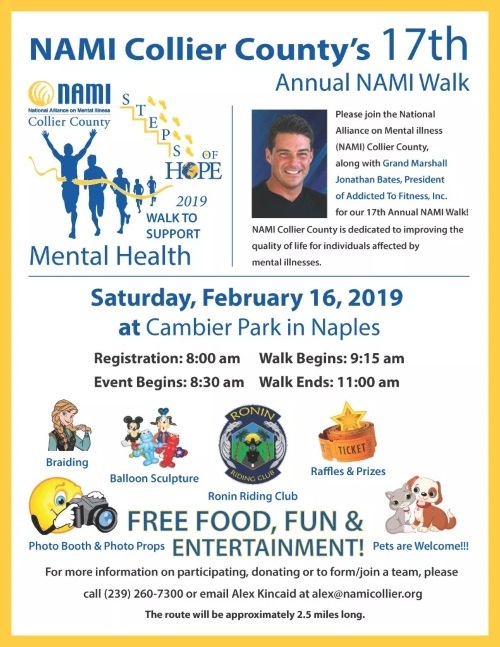 We are asking our church family to support NAMI financially with a small contribution to help fund local activities for the mentally challenged individuals that live in Collier and Lee County. 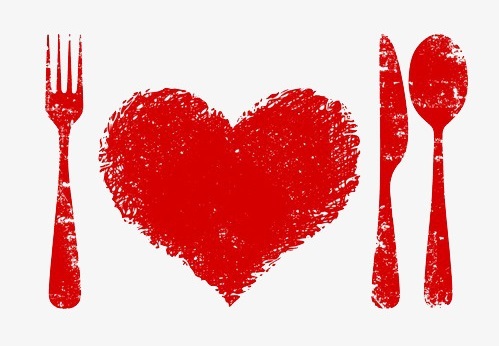 The St. Valentines Day Dance will be held on Saturday evening, February 16, 2019 starting at 6:00pm in the Social Hall. Enjoy an evening with family and friends. Dancing (American dance music) and SURPRISE ENTERTAINMENT will be offered. Please bring a Heavy Hors D’oeuvre item for all to enjoy. Feel free to bring your refreshments of choice. Setups will be provided. Please call Tina Kucera with questions at 239-980-1520. Please return your Stewardship Support of St. Peter’s for 2019. We are responsible to increase what God has given us. 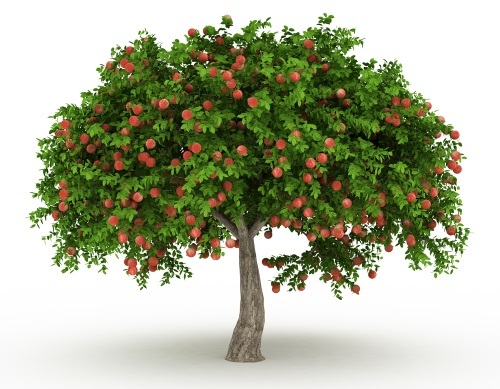 In the Parable of the Talents, the master gave his servants talents that they are expected to nurture and grow. This is a responsibility we cannot avoid. The Church is both a place where the increase begins on the inside of us, and to which we much give some our increase. This too is a responsibility we must take on. A contribution form will be included in the letter you receive. Our goal this year is $200,000. We must meet this goal to avoid using our reserves. If we spend our reserves, we will not be able to obtain a mortgage to buy or build when the time comes to do so (and it will come sooner than later). All of us may have to squeeze a bit to meet this goal. But if give, the Church flourishes and that flourishing spills over into our lives as well and the lives of our families. We must increase what we have been given by God. 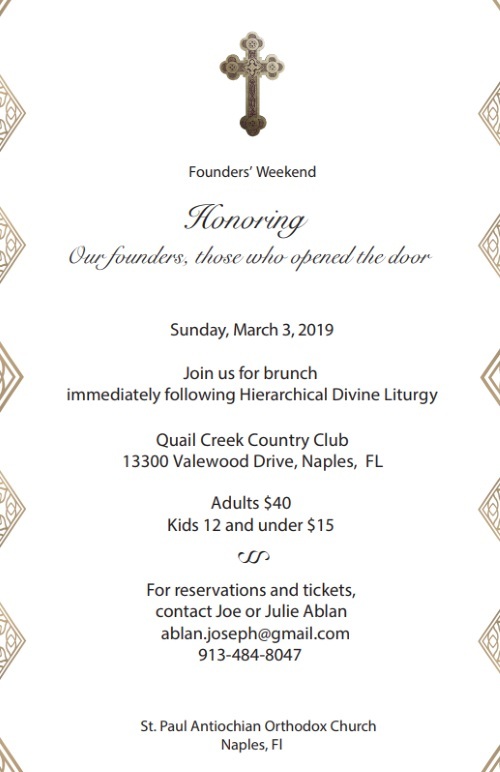 Our sister parish of St. Paul’s in Naples is holding their Founder’s Day Brunch on Sunday, March 3, 2019 following their Hierarchical Divine Liturgy. Bishop Nicholas will be attending. The brunch will be held at the Quail Creek Country Club (get map and directions). If you plan to attend, leave soon after liturgy. 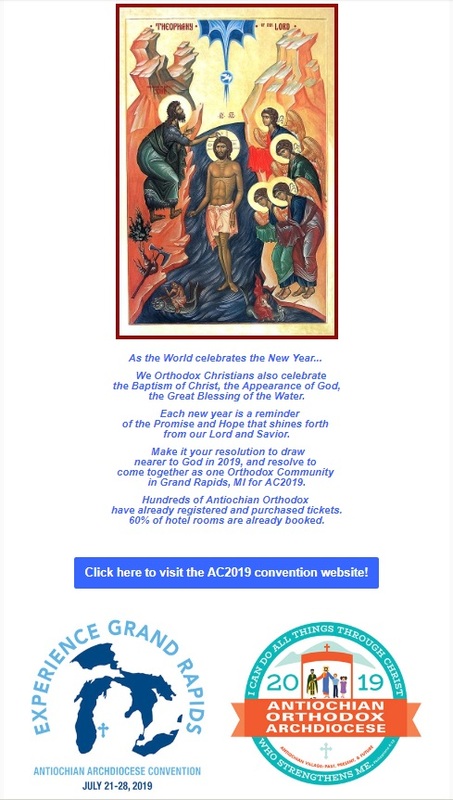 This is a good way to support our sister parish. So far about 10 people are committed to going including our Parish Council Members and Fr. Hans. If you plan to attend, please contact the number listed on the flyer. UPCOMING – Mark your calendars! Make vows to the Lord thy God, and perform them. 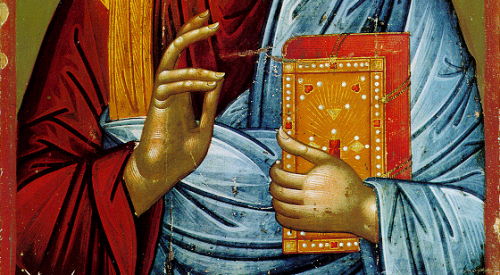 Timothy my son, you have observed my teaching, my conduct, my aim in life, my faith, my patience, my love, my steadfastness, my persecutions, and my sufferings; and what befell me at Antioch, at Iconium, and at Lystra. What persecutions I endured; yet from them all, the Lord rescued me. Indeed all who desire to live a godly life in Christ Jesus will be persecuted, while evil men and impostors will go on from bad to worse, deceivers and deceived. But as for you, continue in what you have learned and have firmly believed, knowing from whom you learned it and how from childhood you have been acquainted with the sacred writings which are able to instruct you for salvation through faith in Christ Jesus.